The agenda for the next Airport Committee meeting, scheduled for Monday, April 29 at 10:00 A.M. has just been released, and one of the items on the agenda is “hangar appraisals”. Anyone renting a hangar from the City could be affected by what the City decides to do regarding the potential sale of the City owned hangars, and might want to attend this meeting, which is open to the public. The meeting will be at the City office, located at 600 6th St., Lincoln. TR Bietsch and his wife Vicki lost their 33 year old son, John to cancer. 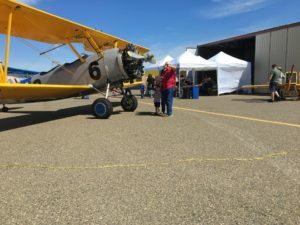 TR and his son frequented our Pancake Breakfasts and TR is a pilot who also flies Young Eagles, and Vicki helps at the Young Eagle Registration table last year. They are having a “Celebration of Life” on April 27, 2019, from 2:00pm through 6:00pm at the Turkey Creek Golf Club, located at 1525 CA-193 in Lincoln. Please attend if you can. am with plenty of hot coffee and maybe even some donuts. We’ll work until we have it done, but hope that will be by 12:00 noon or so. Please come join your fellow chapter members in our hangar endeavors. Many hands make light work, and there may be power tools involved too. 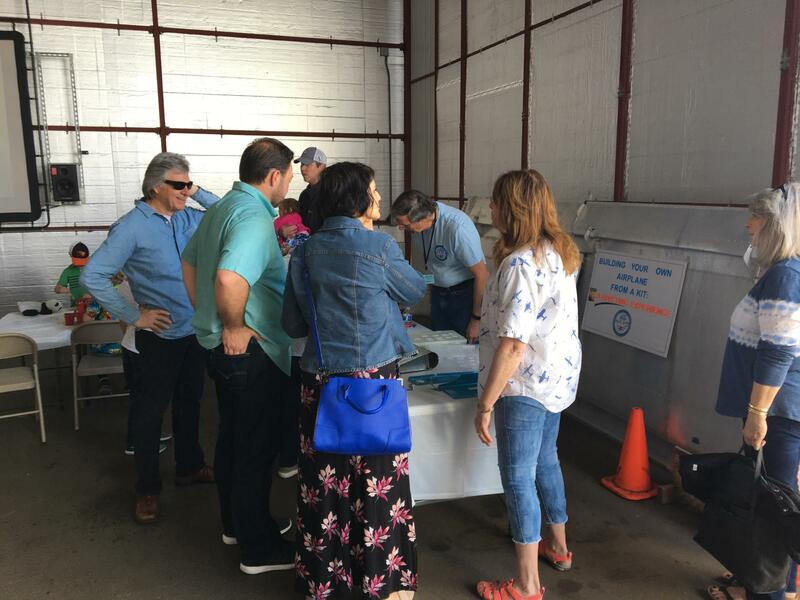 Come on out on Saturday to the Gazebo area at the airport between 08:00 and 10:00 for a pancake breakfast (in support of the Richard and Susan Bristow Memorial Scholarship Program) and to help support the LRAA monthly display day. 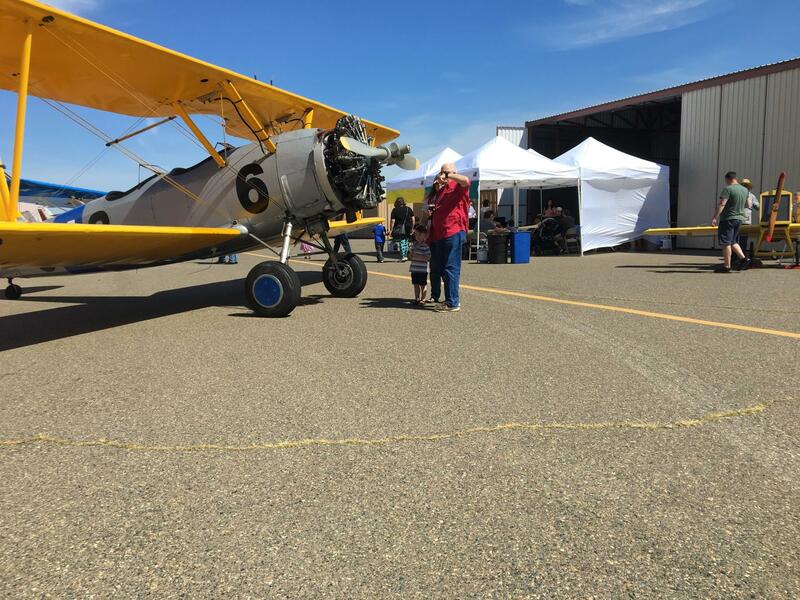 Invite your friends and family to come see the airplanes on display and have breakfast to boot. The fun day made the Gold Country Media. I want to highlight the success our EAA Chapter 1541 enjoyed today as we sponsored our chapter’s first Airport Fun Day. For those who missed it, it was held in and around our hangar today between 11:00 am and 2:00 pm. We had a great crowd of people, mostly families with young children. It was, in my memory anyway, the most well-attended chapter event we have ever held. Crowd estimates are in the neighborhood of 250 people or so, quite a bit more than we expected, and something that required two rapid trips to local grocery stores to restock hot dogs and buns. 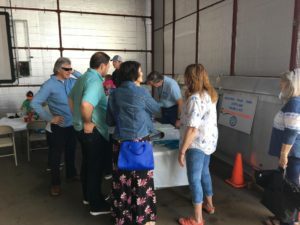 All of our visitors seemed to have a great time…smiles all around…and it was obvious that many had never visited our Lincoln airport or any general aviation airport period. Just the airplanes taxiing about, taking off and landing, and the local skydivers alone generated excitement and interest for both young and old alike. 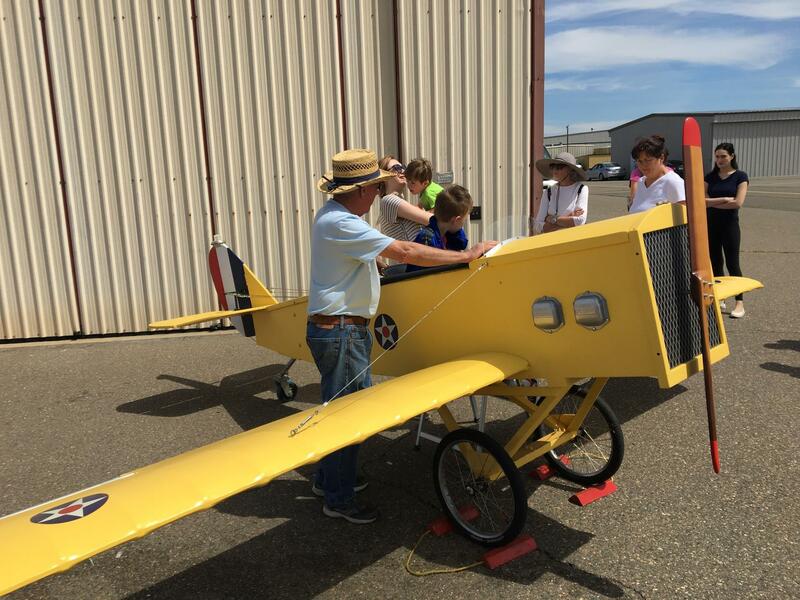 We had six airplanes on static display, and there was always a crowd around each of them. Inside the hangar we had a variety of activities, from a hands-on riveting demonstration to a flight simulator. We had a representative from William Jessup University’s new aviation program on hand, and also a representative from a radio-control aircraft group. 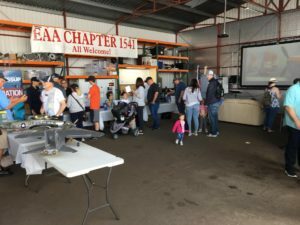 Our own chapter had an information table and a Young Eagles table that provided sign-up information for the chapter’s Young Eagle Rally in three weeks (May 4). For the younger kids, we ran the Disney “Planes” animated movie and had a table set aside for coloring airplane-themed masterpieces. And for all, we provided a hot dog lunch that proved obviously popular. Many hands went into making this event a success, but, at the risk of missing someone, I do want to shout out to a few for special recognition: Erika Wallin and Cheryl Andrade for much of the overall planning and organization; Dug Smith for his tireless grill duty; Tom Lieb for his food support, Darren Coomler for his parking administration, Rubin Wallin for the flight simulator; and Dan and Linda Masys for creating the riveting display. John House and Bruce Estes were also (voluntarily) pressed into sun-impacted duty, the former in crowd control on the taxiway and the latter in manning the kiddie airplane. And, there were a bunch of other individuals from our chapter who dove in and helped out where needed, when needed.